Gameplay involves arranging one’s tiles into a grid of connected words faster than one’s opponents. The object of the game is to be the first to complete a word grid after the “bunch” of tiles has been depleted. The tiles come in a fabric banana-shaped pouch, which means it is the ideal to take on holiday where ever you are going whether that’s camping, boating, caravaning, abroad, or everything in between. There are variants included in the instructions, such as Banana Smoothie and Banana cafe for limited set skills or space-deprived places, and the game is suitable for solo play. It’s almost impossible to explain Bananagrams without also mentioning Scrabble, so I’m not even going to try. Everyone knows Scrabble or one of its derivatives, whether that’s a mobile game such as Words With Friends or the original board game, and most people who play will most likely share the same issues: it’s… quite… slow… to play… and unless you either put a time limit on each turn, or end up playing against someone with a PC for a brain, that game is going to go on for an hour. 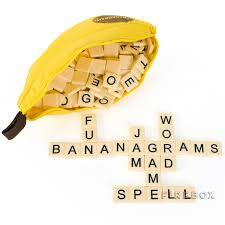 Not so Bananagrams – in fact if your game lasts more than 10 minutes you’ve been taking your time. The reason for that is there are no turns. Everyone plays at the same time, in a mainly-solitaire-but-not-quite style that induces so much panic you’d think you were trying to finish a game before it spontaneously caught fire. In the middle of the table are 144 tiles, all face down, all with letters on. Players take a few tiles (the exact number depends on the number of players) and as soon as someone shouts “Split!” everyone turns their tiles over and tries to arrange them into a crossword style merging pattern. If they manage it they shout “Peel!” and take another tile to try and fit into their words somehow, rearranging words as required. When someone yells “Peel” though, every other player needs to take a tile to add to their own collection, and in the process making their own job a tiny bit tougher. You can return dodgy tiles back to the middle if you like with a shout of “Dump!” but for each tile returned you’ll have to take three more in its place. This means that Bananagrams is also a fun game to play on your own using either all or half the tiles challenge yourself to beat your best time of clearing the tiles. This entry was posted in Board Games, More. This sounds like such a fun game, educational too!